Black Denim with silver decorative contrast stitching, silver tassel and Diamonte top button. 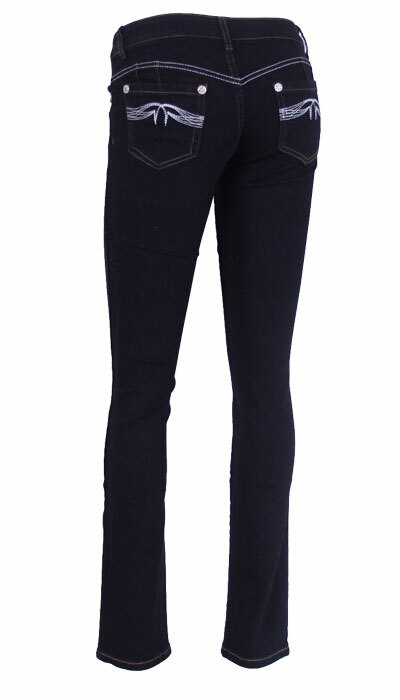 These jeans are really versatile and �are glamorous enough for a night out on the town. All finishing on this garment are manually added to ensure quality. Features four and a half pockets with front zip feature pocket. Diamonte press studs decorate the pocket lining. Please be aware when ordering that due to the fabric composition of many of our styles, the fit is considered small. We recommend up-sizing where possible.